I recently got around to trying a couple of Burly's Burgers, and from what I could ascertain, the burgers are tasty. My first burger was the Burly Heat Burger, consisting of mayo, spicy mustard, pepper jack cheese, jalapeños, bacon, lettuce, tomatoes and onions on top of a seasoned Black Angus beef patty. Despite all the spicy ingredients, no one element dominated and the flavor was spicy yet not overwhelming. Along with average tasting French fries, the burger combo was pretty good. The second burger that I had was the signature Burly Burger, which is nothing more than a typical cheeseburger with lettuce, tomato, onions and mayo. 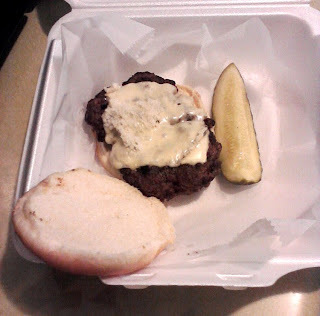 When I ordered mine (the order taken by "Burly" himself, who seems like a nice guy), some miscommunication must have occurred because in getting a "plain" burger, it came with nothing more than cheese. As it turned out, that may have been a good thing because I was able to savor the meat without any distractions. In my opinion, the burger's seasoning, which I believe consists of at least black and red peppers, was superb and nicely complemented the medium well-done (with a little bit of pink) beef patty. In all, the burger was a pleasure to eat. The only complaint that I have about both burgers was that it didn't completely satisfy my appetite. After eating both burgers, I found myself craving for more food. Now this is subjective to my calorie needs and by no means a negative against Burly's, for others could eat what I did and be completely full. However, compared to other burger establishments (Kooky Canuck in particular), Burly's falls short in appetite satisfaction for me. Overall, Burly's Burgers Fries & Shakes is a nice little burger joint that serves good burgers, based on what I had so far. Are they the best burgers in Memphis? Nope. Are they the best in Downtown Memphis? Nope. 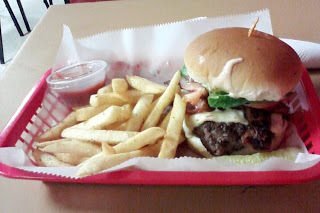 However, Burly's can hold its own with most restaurants in town with both its burgers and friendly service. I hope the restaurant succeeds for I look forward to visiting this place often. A while ago, the Memphis Flyer wrote an article about the five best barbecue sandwiches in Memphis, decided by a poll of the newspaper's staff from among twelve contenders. In reading the article, I noticed an obvious omission: Tops Bar-B-Q, a well known barbecue establishment famous for its pork shoulder sandwiches. 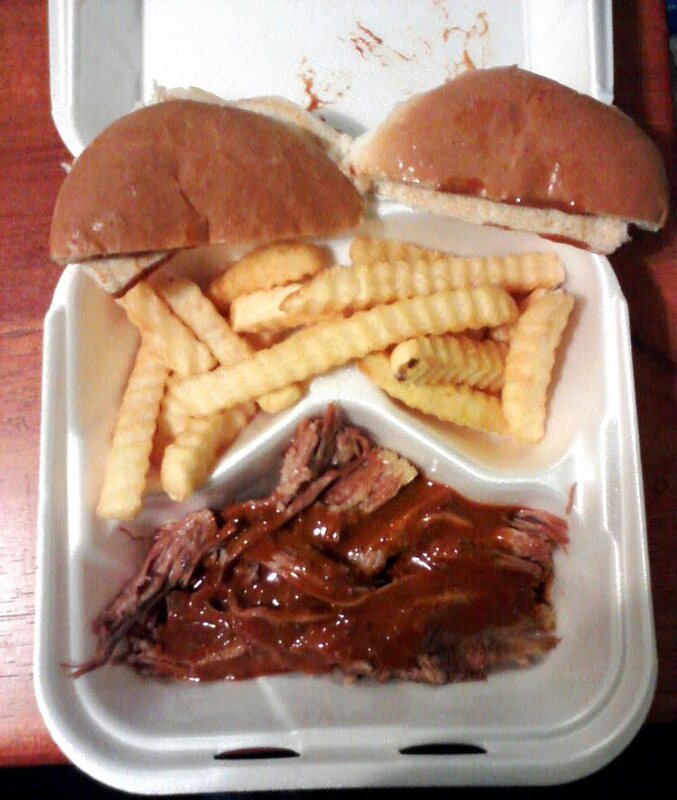 After reading the article, I sent a letter to the editor that criticized Tops' exclusion and pointed out that despite the Flyer's opinion, many Memphians love eating Tops' barbecue sandwiches. I still stand by that opinion, for Tops is a barbecue institution that has earned its loyal following of customers by putting out good (but not great) barbecue and excellent hamburgers. Recently, Tops' barbecue has branched out beyond the pork shoulder and is now serving ribs and beef brisket at most of its locations, so I decided to give their new offerings a try. 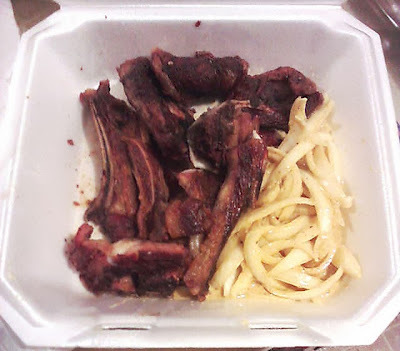 On my first visit (at the Union Ave. location), I got the "Ribs ⅓ Slab" plate with a double order of French fries. As I was eating it, a revelation hit me: Tops' barbecue isn't as good as I thought it was. While the ribs sans sauce is decent, they don't have the smoked flavor that most expect from barbecue. This is not to say that it isn't "barbecue", I am saying that in my opinion, the ribs seem like they were simply roasted in an oven without the benefit of smoke. The barbecue sauce applied to the ribs was Tops' "mild" version that I believe is vinegar based, producing an aroma strong enough to mask the ribs' shortcomings. In eating this, I didn't get any more pleasure out of it than from its pork shoulder plate that cost half as much. The only positive that I gained from this is that I got the ribs immediately after I ordered them. Although this may be a benefit to some, this doesn't impress me enough to order them again. A couple of days later, I ordered the Beef Brisket plate to see what it was like. To make a long story short, it was nothing more than roast beef topped with mild barbecue sauce. If the meat was smoked, I couldn't tell. This is not to say that the entrée was bad, for it wasn't, but it definitely lacked that "brisket" flavor. However, I was able to get my meal quickly so kudos to Tops for that, but the tradeoff was the lack of quality in the preparation of it. 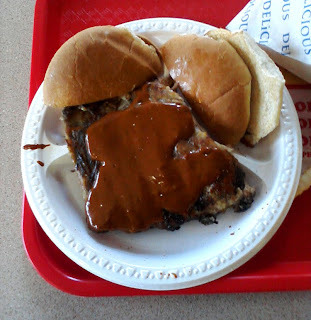 Just pouring BBQ sauce on meat doesn't make it barbecue, but somehow Tops has managed to get away with it for decades. I definitely can't see myself ordering this again. Now I see the logic, though flawed, in the Memphis Flyer not including Tops in it's comparison of barbecue sandwiches. The paper should've included it in order to point out the characteristics of the sandwich and how it measured up against the competition. I'm guessing that the Flyer's conclusions would've been the same as mine. To sum it up, Tops Bar-B-Q is great for those who are in a hurry and need a quick bite to eat, but for true aficionados, I would recommend going elsewhere for the smoky goodness. On a Friday night in February, after having a few beers with friends at The Flying Saucer, I decided to grab dinner at a place that I've never been to before. After thinking about it, I decided to satisfy my curiosity by going to another African themed restaurant, Africa Restaurant (the name of the restaurant used to be Kaloum, but for some ridiculous reason, the owner changed the name to something that is ridiculously generic and, in my opinion, unimaginative from a marketing standpoint). After the experiences I had at Gereny, which was negative (and had closed, replaced by a Don Don's Hot Wings franchise), and Abyssinia, which was positive, I went to "Africa" with absolutely no expectations. When I arrived there, it was a little after the restaurant's 8:00 P.M. closing time, and most of the people who apparently work there were leaving. After going inside, I noticed that there was only one person working behind the counter, and nobody in the kitchen, as far as I could tell from the lack of noise. Before I could place my order, the man working the counter told me all that was left was lamb, and I knew right then that I was in for another "Gereny" experience in not getting to choose what I want from a menu. Not in the mood for searching somewhere else to eat, I accepted what the restaurant was serving, which was lamb spare ribs (I think) and onions doused in a yellow sauce. Even though I wanted to eat there, my order was placed in a "to-go" box. Maybe I should have insisted on dining there, but if I wasn't going to get good service due to a lack of waitstaff, it was better for me to eat at home. As for the meal itself, it was okay. Given that the food was already cooked before I arrived at the restaurant, I got the sense that I was eating "leftovers" from earlier in the evening. That said, the spare ribs were a bit dry and had a seasoned, salty taste. The onions, doused in the yellow sauce, had a vinegar flavor with a little bit of an onion aftertaste. Overall, on a scale of one to ten, I would give the food a "6" because of the uniqueness of the onions and the "so-so" taste of the lamb spare ribs, and would give the service a "3" because of the meal being essentially "leftovers" which didn't go over well with me. After my experience at "Africa," I'm not sure that I wanted to go back. On the one hand, any restaurant can have a bad night. However, if a restaurant puts out a lackluster effort on my first visit, I can't be confident that it will be better the next time. Based on the review that I read in The Commercial Appeal, I went there again, but with very low expectations. For my second visit that occurred on May 17, 2011, I arrived a little before noon. As I was walking through the door that was propped open (letting in flies that was an annoyance later on) I noticed a barbecue grill, apparently a sign that the food (at the very least, the meat) will be fresh. When I went inside, there wasn't anyone dining there, just like my first visit. After walking over to the counter to review the menu, I told the man working it what I wanted, which was the Lamb Mafe, but he told me to get the Saga Saga, a cassava leaf soup. Not in the mood for soup and feeling as though I was getting the "Gereny" treatment again, I thought about walking away and having lunch elsewhere, but I decided to give one more shot at ordering from the menu. I eventually went with the Thiebu Djeun (Djol of Rice), which is tilapia stewed in tomato sauce and served with cassava (the root, not the leaves), cabbage and a carrot strewn over a bed of "exotic" rice. It comes with a side of habanero pepper sauce which is EXTREMELY HOT, so it wouldn't be smart to spread the entire cup over the entrée unless you have the stamina to handle it. It took a little over five minutes after placing the order that I got my food, which was a LOT (so much so that the "fullness" of the meal carried over to the next day)! In getting this fish entrée, I didn't remember to ask if it was a filet (i.e. boneless), meaning that I was stuck with the head of a tilapia that had a lot of bones in it that I had to remove. Although removing the bones was irritating, the reward was well worth it. The fish was tender and a little spicy, likely seasoned in something foreign to me but tasted great. The rice had a nice seasoned flavor as well that perfectly complemented the tilapia, and a little bit of the habanero pepper sauce made it even better. The vegetables that I had were decent, including the cassava which was my first experience in eating. At first, I thought it was a banana, but after biting into it, the taste resembled more of a potato and it was pretty good. Overall, I enjoyed it, despite a pesky fly that flew around my plate during the meal. 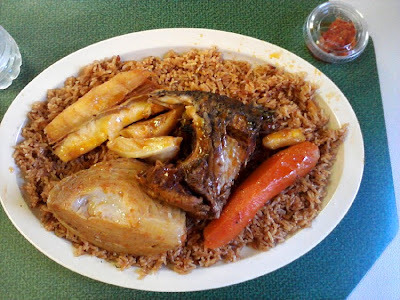 After my second visit, which was much more enjoyable, I came to the conclusion that African restaurants in general, and by extension, African culture, is something different that is foreign to Americans and others unfamiliar with the laissez-faire way that Africans approach life. As it applies to operating a restaurant, they don't always follow protocol in offering their entire menu (in the case of Gereny, no menu at all), but rather cooking up whatever they presently have. From my perspective, this isn't something that I could get use to, for I like consistency in the places I dine at, but I can respect and even indulge it on occasion. After all, it is what it is. Good "hot" wings, everything else "OK"
After spending a "Sunday Funday" afternoon at the Flying Saucer, I decided to go grab some take-out before heading home. After some deliberation, I decided against going to a typical fast food joint like McDonald's or Wendy's and opted for some local flavor. Remembering that a new wing place opened on Jackson Ave., I decided to give it a try. 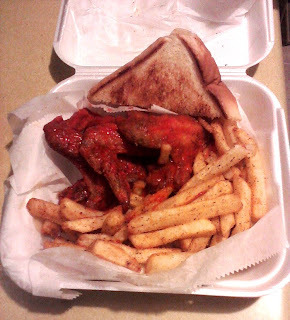 In choosing Top Of The Line Wingz ~N~ Thingz, I assumed it was just another indistinguishable wing joint, putting out wings that aren't any different than Crumpy's, D'Bo's or the nearby Chicago'z Fast Foods, but I have come to find out that this isn't true. (By the way, using a "z" in place of an "s" at the end of words isn't the catchiest of gimmicks, although it adds a little "ghetto" flavor that either has a positive or negative effect on marketing, depending on the demographic that you're trying to reach). With this being my first visit, I decided to play it safe and chose the three whole wing combo with hot sauce, assuming that I would get the typical hot wing experience. When my wings came out, I could tell by the aroma that this was going to be different, in a good way. The wings are fried just right and are nicely tenderized, which makes it easy to separate the "drummies" from the actu al wings. As for the taste, it is combination of salt and other spices that I couldn't precisely identify, although if I had to guess, I would say that black pepper was one of the ingredients used. The taste was definitely unique, which is a nice change of pace from the many other wing places in Memphis. Along with the fries and soda, the wings made for a nice meal that left me wanting more. 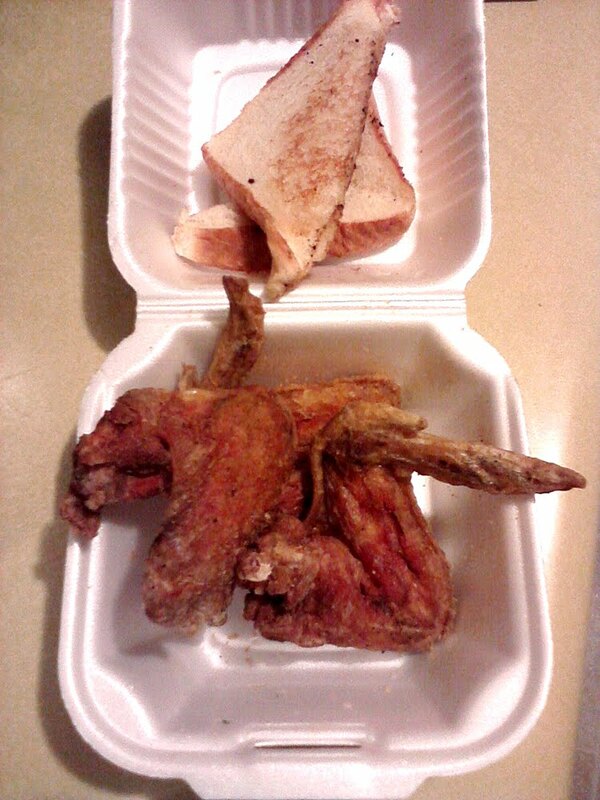 For my second visit, I tried the Garlic Parmesan wings that is Wingz N Thingz's feature menu item. The wings are breaded in seasonings that is obviously garlic-based, then fried and sprinkled with Parmesan cheese. The process makes the wings a bit flaky, leaving lots of crumbs as they are eaten. As for taste, the garlic is noticeable but not overwhelming, and the cheese is a decent complement although the combined flavor was nothing more than mediocre. The ranch dressing is a good choice for those who like dipping their wings. After eating these wings, I can't say that I would recommend it but I won't discourage anyone from trying it. 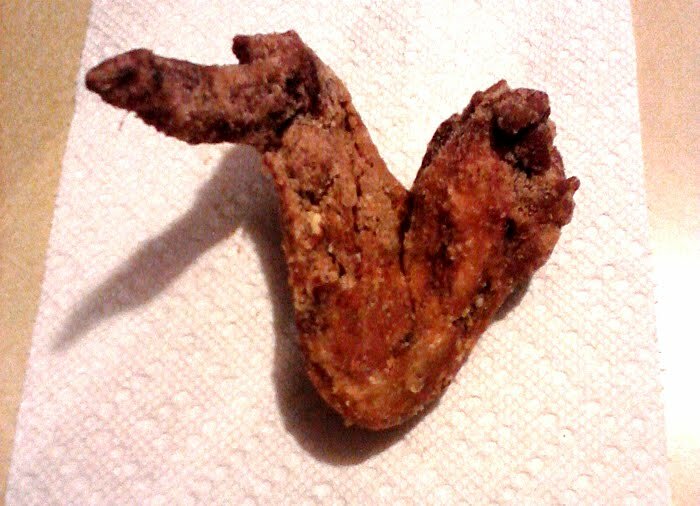 During my third visit, I went with the "seasoned" wings, which are simply the restaurant's ver sion of fried chicken. The seasoning is similar to what is in the wing joint's hot wings, but in my opinion, it doesn't taste nearly as good on the seasoned wings. 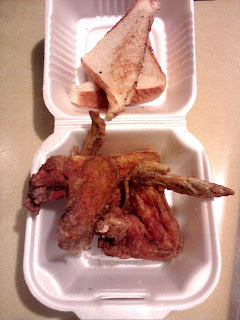 The wings were nicely breaded and tender, which made for a good eating experience. However, when compared to places like Gus's and Uncle Lou's, Wingz N Thingz's seasoned wings would rate a "6" on a scale of ten. However, like the Garlic Parmesan wings, I wouldn't dissuade anyone from ordering them. As for the "Thingz" part of Wingsz N Thingz, the food is okay, for the most part. The chili cheese dog, consisting of a "regular" (as in typical) size hot dog with chili and cheese (possibly Velveeta), was decent, although the chili was a little saltier than what I'm used to. The Jumbo Hamburger, featuring a 1/3 lb. beef patty which I had with cheese and no onions, didn't taste any different from most burgers that I've had in the past. As such, it was a little too salty for me, but not to point that it was uneatable (nearby burger places like Tops and Alex's Tavern need not worry about competition from this place). 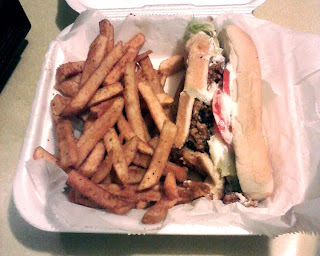 I also tried the Philly Steak sandwich (which I suppose the restaurant is passing off as a cheesesteak) that is nothing more than a hoagie with onions (which I omitted), lettuce, tomato and mayonnaise (lots of it). The Philly has a decent amount of meat (about the same as Subway's steak sandwich) but it falls far short of being a genuine cheesesteak (for those seeking the real thing, check out either Juicy Jim's or Broadway Pizza House). Overall, the "Thingz," like most of the "Wingz" (except the hot wings) are okay but not overly impressive. After making several visits to Wingz N Thingz, my impression of the place is that it is a decent place that provides good food at a reasonable price. In terms of quality, the food is what it is for the price, which isn't a bad thing for those on a budget. Because of the proximity to my house, I will probably visit this place often for the hot wings (though not late at night, for the area surrounding it is a little sketchy) but it probably won't be a substitute for any of my favorite restaurants where I get some of my best meals from. Still, the restaurant will probably do well in attracting residents in the Klondike neighborhood and might even draw in a few customers from the nearby Vollintine-Evergreen community in Midtown. Because of the impeccable taste of some of my friends, I'll stop short of recommending this place, but I'll urge anyone to give Wingz N Thingz a try and judge it for either himself or herself. UPDATE: Since this review, the name of the restaurant has changed to "Crumpy's Wingz & Thingz" (I'm not sure if it's an official part of Crumpy's hot wings chain).